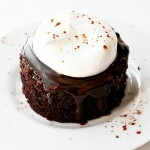 Chocolate cake, flavoured with stout beer and topped with chocolate glaze and whipped cream. Perfect for St. Patrick's Day dessert. This cake is rich and moist but not cloyingly sweet. It's the perfect ending for a St. Patrick's Day meal. I usually use Guinness beer but a chocolate stout would be excellent as well. You can serve this cake in a regular square slice or to dress it up a bit, cut rounds out with baking rings. For the cake: Preheat your oven to 350° and spray a 9x13-inch baking pan with non-stick spray. Line the pan with parchment paper, leaving some hanging over the sides to help lift cake out later (*don't skip this step or you'll have trouble getting this one out of the pan!). Spray the paper with non-stick spray as well. In a large saucepan over medium heat, bring 1 cup stout beer and 1 cup butter to a simmer. Add the cocoa powder and whisk until mixture is completely smooth. Remove from heat and let cool slightly. Meanwhile,whisk together the flour, sugar, baking soda, and 3/4 teaspoon salt in a large bowl. Set aside. Using an electric or stand mixer, beat together the eggs and sour cream until well combined. Add the slightly cooled stout-chocolate mixture to the egg mixture and beat just until combined. Add the flour mixture and beat on low speed until just combined. Using a rubber spatula, fold batter until completely combined. Do not overmix. Pour the batter into your prepared pan. Bake the cake in the preheated 350° oven until tester inserted into centre of cake comes out clean, about 30-35 minutes. Transfer the cake, in it's pan, to a rack and cool for 10 minutes. Lift the cake out by the exposed parchment paper sides and move onto a cooling rack and cool completely. For the ganache: Bring cream to a simmer in medium saucepan. Remove from heat. Add the chopped chocolate and whisk until the chocolate is melted and smooth. Allow to cool at room temperature. Pour over cake before serving. For topping: Whip 1/2 cup whipping (35%) cream with 1 Tbsp. sugar until soft peaks form. To serve: Place a slice (or rounof cake onto a plate. Spoon ganache over top of cake until it begins to run down sides. Top with a spoonful of whipped cream. Dust with cocoa powder or shaved chocolate, if desired.